The 16 year old just rolled in from her friend's birthday party (it was 12.40pm the day after). She is normally a remarkably well-behaved young lady but I had been forwarned by her text at 9am ("I just threw up!" said with some pride) that she may feel a little delicate. I tried to think of something to snack on which would give her some energy and protein without resorting to the good old English breakfast routine laden in grease. So it was that I found myself skinning chick peas to make hummous. I know it is completely unnecessary to skin them, as the skins are perfectly edible, but it makes a dramatic difference to the quality of the finished product, and, it's not as if I have anything else to do - according to the teen anyway! I have been eating lots of hummous, and variations on this recipe using different beans. Large butter beans have become a particular favourite, especially since they are much quicker to skin than chick peas. 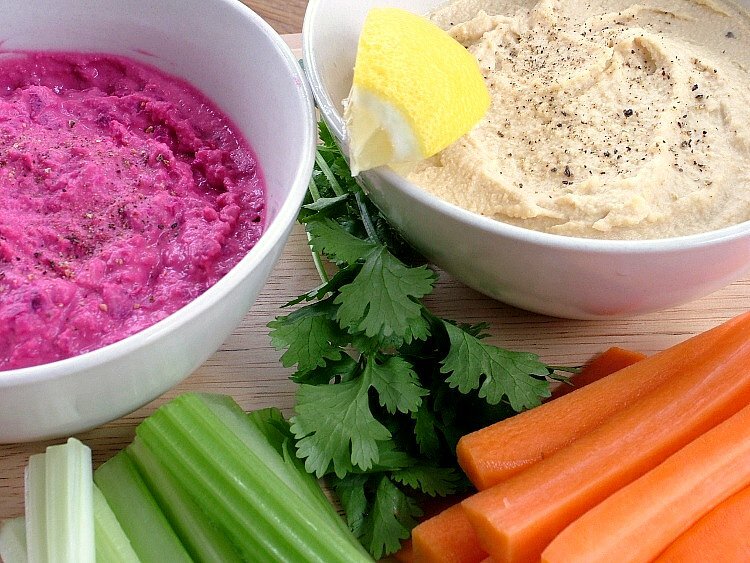 Don't be put off by the garish colours of the beetroot hummous and the carrots, they really do taste great together. 250g cooked chick peas (drained weight), popped from their skins if you can be bothered. Whizz the chick peas and chopped garlic in a food processor until they are finely ground. Add the tahini and whizz again till combined. Add lemon zest and juice, whizz again. Add the olive oil and blend. If the puree is still dry, add water as the processor is running until you get the right consistency for you. Divide the hummous into 2 bowls - put 200g into one bowl and set aside, scrape the rest into another bowl. Peel the beetroot, pop it back into the (unwashed) food processor and whizz till very finely chopped. Add the smaller batch of hummous to the food processor and whizz again until all combined. Check for seasoning then scrape back into the serving bowl. Serve with sticks of fresh carrot and coriander. If I was making this for myself I would have grabbed a quarter of preserved lemon (rinsed and flesh removed) and popped it in with the chick peas, however the teen doesn't like this so I omitted it just for her, now there is a caring mum! That Pink hummous is just soo, ..pink. I can think of two markets for it straight away.